Colombia’s biodiversity is soon to be revealed in greater depth than ever before, stimulated by a new consortium that will allow the world’s second most megadiverse country to help drive the big data revolution. The “C3Biodiversidad” consortium, created by 16 leading Colombian institutions with the support of Earlham Institute, BRIDGE Colombia, and GROW Colombia, will build capacity in research cyberinfrastructure in a country teeming with wildlife and biological information. A better understanding of Colombia’s biodiversity on a national scale will drive the growth of the Colombian economy. Over the next few years, enabled by the recent peace agreement, large amounts of data about the megafauna will be collected, and the capacity to share and analyse this information needs to keep pace with the vast wealth of information gleaned from these new explorations. 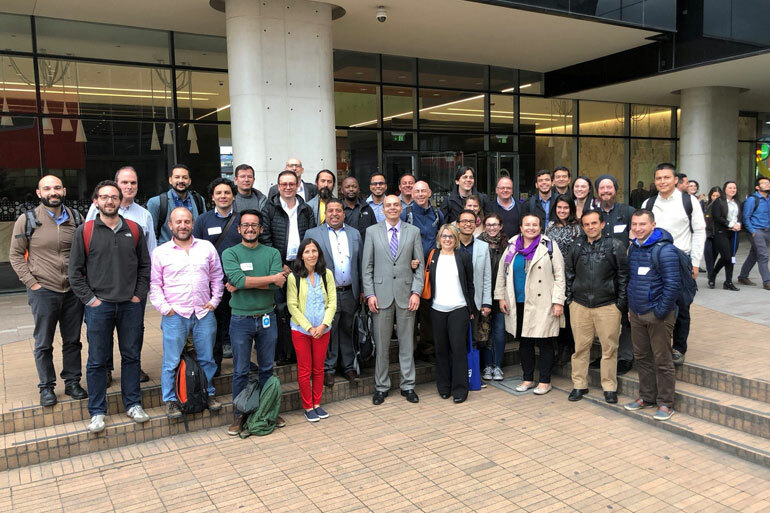 In June this year, Earlham Institute organised a workshop in Bogotá, Colombia, that brought together important players in the country to design a strategy to develop research cyberinfrastructure that can cope with these needs. Colombia is a country of stunning beauty and megadiversity; geographically, culturally and biologically. A greater understanding of this biodiversity is not only key to conserving and promoting it, but can also drive economic growth, social equality and a sustainable peace in Colombia, especially now that the FARC rebels have put down their weapons. One way of ensuring the efficient and accurate analysis of such abundant data is to cultivate and foster research cyberinfrastructure - advanced shared computing resources along with a community of skilled people who ensure that they are operated in a sustainable, secure, collaborative, and interoperable way. Colombia is the number one hotspot for orchid, bird and amphibian diversity worldwide, with vast regions yet to explore - an “environmental powerhouse.” However, exploring and investigating the swathe of information contained within each of the thousands of species of these organisms, especially with the advent of modern life sciences methods, starts to stretch the capacity of single research groups. As its first initiative, C3Biodiversidad is producing a technical white paper to inform research policy among policy-makers as well as scientific materials to disseminate the consortium mission, while engaging with a diversity of stakeholders in Colombia and the wider region. A recent award from RCUK’s Global Challenges Research Fund is set to stimulate the bioeconomy by increasing knowledge of Colombia’s greatest treasure, its biodiversity, following the peace agreement. This project, “GROW Colombia”, aims for research excellence through promoting innovative technologies, developing resilient research capabilities, building partnerships, and fostering best practice in knowledge exchange, with longer-term goals to stimulate economic and social growth. UK-based researchers are working with Colombian researchers, industry partners and crop breeders to study the genetic diversity within the country’s unique biodiversity, documenting its distribution and the threats it faces, as well as to gain the skills needed to drive sustainable innovation and to attract further public and private funding. The BRIDGE Colombia network (www.bridgecolombia.org) is a multidisciplinary network of research organisations in the UK and Colombia founded in March 2017, focused on the development of robust coordinated activities under a shared vision centered on biodiversity as a means to achieve sustainability and peace. “GROW Colombia” sits alongside the BRIDGE Colombia network. The network actively facilitates collaborative and fully integrated research programmes; promotes research excellence and the use of innovation in technologies and approaches to develop resilience in research capabilities; stimulates partnerships; and promotes exchange of knowledge. The Consorcio Colombiano de Ciberinfraestructura para la Biodiversidad (Colombian Cyberinfrastructure Consortium for Biodiversity) is open to stakeholders interested in developing a research cyberinfrastructure in Colombia. It was created on 28 June 2018, in Bogotá, by a cohort of experts in the field following an declaration where they agreed to produce a series of outcomes with the overarching objective of “producing the indispensable knowledge about the natural and agricultural biodiversity in Colombia” in order to “drive the growth of a bioeconomy in Colombia”.